With tax time around the corner perhaps money is on your mind. This app can help you count it! Actually, it can help you teach your students how to count money in a very interactive fashion. Users of SmartNotebook know that there are many kinds of interactive activities for math instruction but this app is made specifically for counting and using coins. Sometimes you want something quick and you want it now, Math Pieces, by the Math Learning Center, might do just that. Did I mention that it is free? Here is a site to help you find the Math Pieces Chrome along with other good Chrome Apps for math made just for you. I wanted to share with you an exciting discovery of mine regarding EdPuzzle and Google Classroom. EdPuzzle is a tool that lets you assign videos to your students. Not just any videos but videos that you can trim and add your own questions and comments to. If you are not yet using it, it’s worth a look. Google Drive is part of Google Apps for Education that allows for smooth communication between teacher and student as well as streamlining the distribution of assignments and activities. 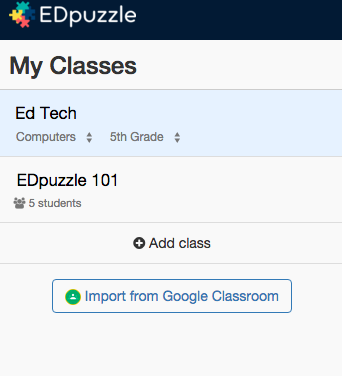 Recently I found that EdPuzzle makes creating a classroom a snap if you already have students in Google Classroom. That magic happens with the “Import from Google Classroom” button. Select an existing class or Add class and then “Import”. Sweet. Do you have a “Plan B”? Last week’s web page outage made me think out the importance of Plan B. I would like to preface the following statements by stating that web page outages like the one my district experienced last week are rare. Our IT department works incredibly hard to keep everything running smoothly however not everything is within their control. Last week’s hack was a great example. That being said, there is nothing wrong with giving yourself a little piece of mind with a Plan B.
You’ll find my Plan B below. It is a very small Symbaloo with links to my most basic and frequently used websites. Making and sharing your own Symbaloo is pretty easy; if you can cut and paste links you have all the skills to make your own. They even have their own free version called EduSymbaloo that includes a network of great link collections that you can add to your own. Visit EduSymbaloo and see if it would help you with your Plan B. Meanwhile, if you are from my district you could open the symbaloo below and bookmark it for easy reference. Working with Google Calendar today an older Chicago song with the lyric “Does anybody really know what time it is?” is on an infinite loop in my head. With Google Calendar, everyone can stay on the same page. With it teachers can keep track and share assignment due dates, send invitations to parents and peers to collaboration sessions and be notified when planned events have changed. GAFE has another feature not available for the general public, appointments. After feedback from educators, this feature was brought back from Google’s chopping block because of its usefulness in an educational setting. If you have yet to work with calendar I would highly recommend it. Record your screen in Chrome. Today we learned how to make a screencast. The original intent was to use Screen-Cast-O-Matic but due to the fluid nature of the internet, their Google authenitcation piece was not up to Google’s current policies and was not coopertive. This led us to explore other alterntives such as Chrome’s ScreenCastify. This worked well. There are a few things to keep in mind while using it. As soon as the extension is loaded it will be ready to go. Any setup prompts can be ignored at this point. It may begin recording willy-nilly so just click stop and delete recording; it should behave after that. When you want to record, pay attention to the setting that asks which view you’d like to use. Most often you will want to choose to record the entire screen. When you are through you are given the choice to save it to your drive and/or YouTube. Today was a challenge. The Google server was intermittent and a challenge. We quickly became experts at chrome’s offline capabilites. Learning is not linear just because they start with the same letter. We learn when we encounter a change in our environment. The collaborative nature of GAFE is both a blessing and a curse. You want to give collaborative access to others but what if you want to place certain areas off limits. Did you know that you can protect a range of cells within Google Sheets? With just a few clicks you can make certain areas off limits to others while still allowing editing on other areas. I could see this being useful with students as you could share a sign up sheet with the confidence of knowing that the basic structure is protected. I’ve designed a demo that shows how this works.